Hackers celebrate the Christmas spirit by placing a decorated tree in Lobby 7 during finals week. One of the final steps in the planning of the new undergraduate residence hall was completed recently with the selection of architect Steven Holl. 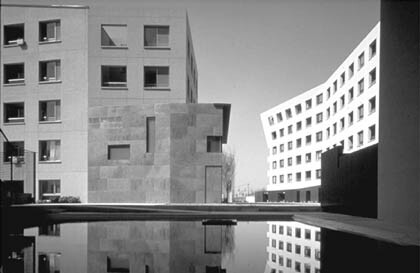 Holl, principle architect for Steven Holl Architects in New York, is a professor of architecture at Columbia University. The architect selection committee "wanted an architect of the first rank, somebody who had experience with housing and experience on university campuses someone who could relate well to MIT and someone who would work well with our students and our faculty," said Chancellor Lawrence Bacow '75, a member of the committee. The committee started with a list of approximately 100 different architecture firms "of the caliber that we associate with MIT," Bacow said. The committee used these criteria to eventually narrow the list to five firms. Those firms were invited to campus for presentations and interviews. Holl was the first choice of the committee. "[Holl] is really an exceptional individual and I think that he's going to produce an exceptional building for us," Bacow said. "It was quite extraordinary how well he understands space from the largest context to the smallest detail," said Dean for Undergraduate Education Rosalind H. Williams. Holl has received many awards for his designs, including the 1998 Alvar Aalto Medal from the Finnish Association of Architects for Kiasma, a museum of contemporary art in Helsinki. This award is notable given the predominance of Finnish architecture on the MITcampus Aalto designed Baker House. "[Kiasma] was just breathtaking; it really holds its own against the Aalto tradition and in choosing the architect we had the Aalto tradition in mind," Williams said. 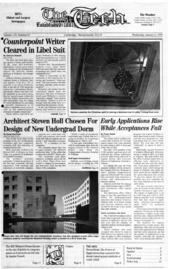 "We are asking him to design in a tradition of [Finnish architects Alvar] Aalto and [Eero] Saarinen," Bacow said. Saarinen designed Kresge Auditorium and the MIT Chapel. Holl has extensive experience with educational institutions, including rebuilding a wing of the Pratt Institute, an architecture school in New York; an addition to the University of Minnesota's School of Architecture; and master planning for University of California, Mission Bay Campus. The selection committee included Bacow, Williams, William Mitchell, dean of the School of Architecture and Planning, Robert Simha, director of the Planning Office, and Victoria Sirianni, director of the Department of Facilities.